This is a not-to-be-missed experience for the prudent investor. And it's being offered at a tremendous value. Normally, registration for a 3-hour event with speakers like these would cost hundreds, if not thousands of dollars. Of course, you'd also need to add to that sum your travel costs of getting to the event. Axel Merk - Axel Merk is the President and Chief Investment Officer of Merk Investments, and manager of the Merk Funds. He's an expert on macro trends and his investment advisory firm offers funds and advisory services on liquid global markets, including domestic and international equities, fixed income, commodities and currencies. G. Edward Griffin - Ed Griffin is a researcher, lecturer and film maker, and author of the book The Creature From Jekyll Island, the exhaustive and definitive work on the formation of the Federal Reserve. In addition to his expertise on the Fed, he is also known for his coverage and commentary on international banking, terrorism, taxation, U.S. foreign policy, cancer, the Supreme Court, and the U.N.
12:05pm to 12:40pm EST -- G. Edward Griffin will explain how a private banking cabal gained control of America's monetary system through the formation of the Federal Reserve, and how it has since metastasized to control the financial and political systems as well. A massive wealth transfer from the public's pockets has been the result, and will continue until the system is bled dry, just as any parasite left unchecked will kill its host. 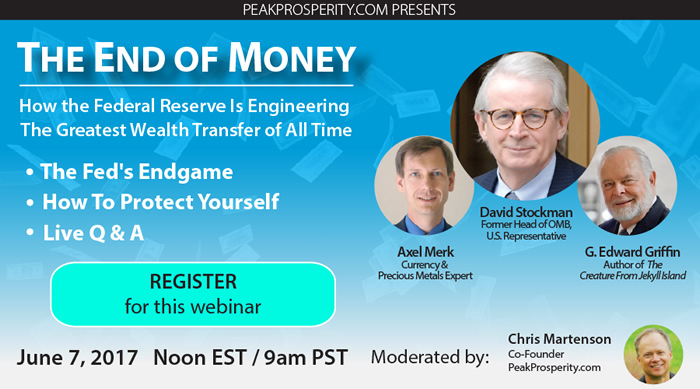 1:20pm to 1:40pm EST -- Axel Merk will share his learnings from his recent time spent with past and current Federal Reserve regional presidents. He'll explain how the Fed's actions have created massive asset price bubbles that will be extremely destructive when they collapse. Similarly, the Fed's actions have destroyed the incentive to save, as well as doomed pensions to insolvency -- creating a massive brewing retirement crisis. If this first webinar goes successfully, that will enable us to produce more of these 'gatherings of great thinkers' for you in the future. We have great hopes for this new webinar platform, but how much we use it in the future will be a direct function of how many people like and attend these live events. So if you want more of these, please participate! I will be at work on 6/7 but I am interested in watching this. Will you be posting it for watching later that day/week? Do you need to be a premium member in order to do so? Really enjoy the site found it a few months ago. It has given myself and family direction on "what should we do?" Yes! After the live event, the platform we're using will provide all of those who registered (whether they were able to watch live or not) with access to an archive video of the event. So if you end up missing part or all of the live event, you can replay it as much as you like afterwards. Will this be video with graphs and such or audio only? It will be live video. There will likely also be some charts and other visuals, but not too many. The presenters will have the option of sharing up to 3 slides each during their presentation - but I don't know yet if every presenter will choose to use them or not. Will this be made available to all PP subscribers at some point ? I missed the registration deadline, and now it seems to late to register for it. We'll be announcing this more broadly on the site shortly: for those who missed registering for the live webinar but would still like to see it, we're making access available to a video of the full 3-hour event for $75. If you're interested, email us here and we'll send over the details for gaining access. To your specific question, dreinmund, no, this webinar will not be made generally available to all subscribers. That said, now that we have our webinar platform up and running, Chris and I will be producing certain webinars expressly offered to all of our paying subscribers. And from time to time, we will also create ones available to the general public. And, once a quarter or so, we intend to produce "big" events like this recent one, which will be available to anyone who purchases access.